A New Lesson! It's time to explore a still life painting in watercolor. 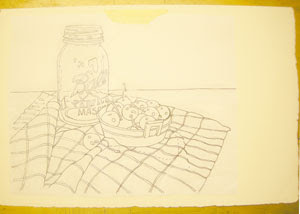 I have worked on a drawing and now I am going to trace it onto my watercolor paper. I used Arches 300 pound cold press paper. I used a Chunky Graphite Stick (from cheapjoes.com) and applied a thick coat of the graphite to the back of my drawing. I used a tissue or piece of paper toweling to gently rub the graphite. This smooths it out and removes any extra crumbs. I use one piece of masking tape to secure the drawing to the paper. This provides a hinge which keeps the drawing in place, but allows me to lift it occasionally to see that I am capturing everything as I trace. I like to use a ball point pen to trace. 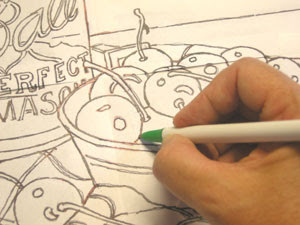 I find that I don't have to push hard, it is easier to see what I have traced since the pen is usually a different color than my drawing, and it provides a nice, thin line on the watercolor paper. Now I use two-inch masking tape and tape all edges of the paper to a foam core base. Be sure that at least 1/2 in of the watercolor paper is covered with tape all around. If you tape less than 1/2 inch, chances are the tape will not hold when you apply the wet washes of color to come. If you would like to paint along with my blog lessons, you can get the photo references and drawings sent to you by visiting my etsy shop, clicking on the Online Lesson icon, and pay a small fee of $5.00. I will then email to you the photo references and the drawing.